Each Thanksgiving my family descends on my aunt’s home in Canton. Between sixty and seventy of us spend the day chatting, drinking my uncle’s killer spiked eggnog, and eating the entire day away. My Italian heritage means there is course after course of amazing food. It also means everyone contributes something to the table. I bring a pumpkin. On the outside, my pumpkin isn’t remarkable other than being a gorgeous ochre color from an hour or two roasting in an oven. Lift up the lid, however, and behold the magic. Bright orange flesh contrasts the melted cheese, browned sausage, and dried cranberries. Mouthwatering aromas of cream and nutmeg waft up from the gooey center. 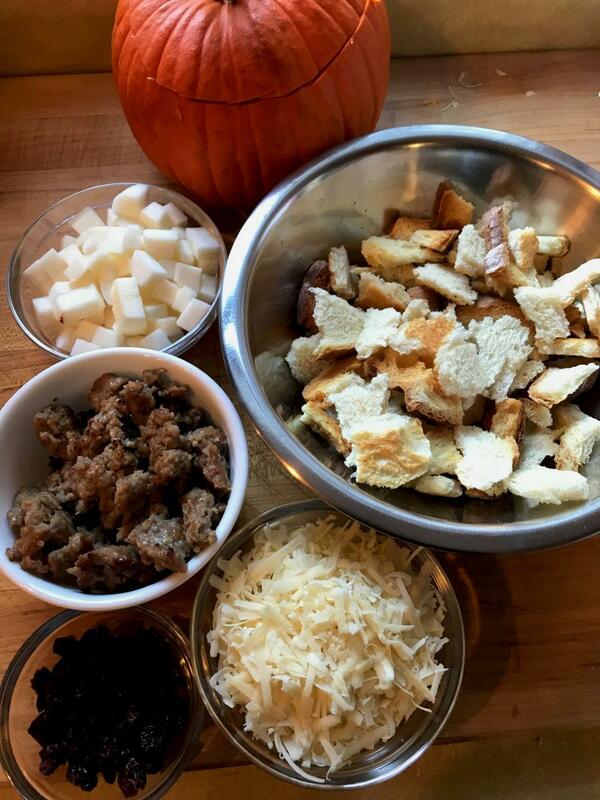 Scoop the soft pumpkin meat from the sides, incorporate it into the stuffing, and you’re ready to eat. I came across this gem of an idea watching Anthony Bourdain’s Parts Unknown a few years ago. He was traveling with chef Daniel Boulud to Lyon. Towards the end of the show, they share a meal with Boulud’s family in the countryside. 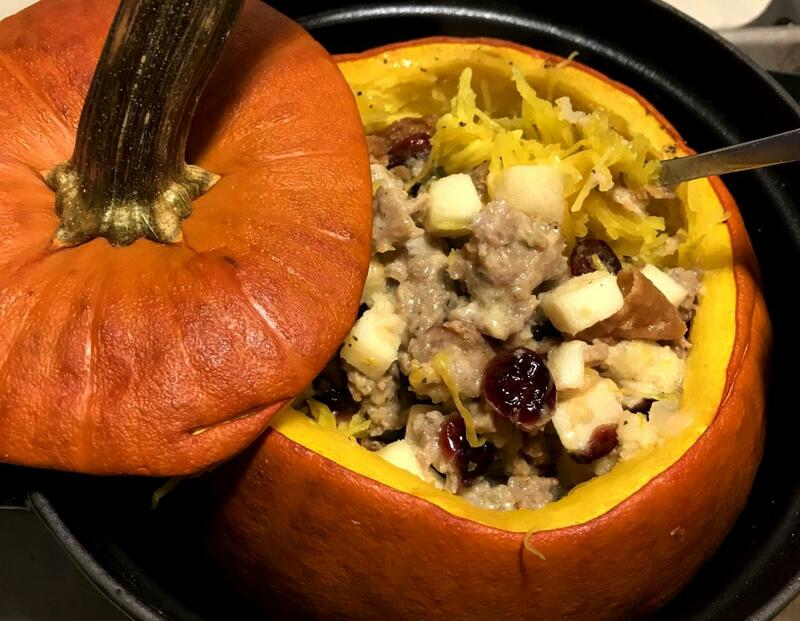 They baked a giant pumpkin stuffed with bacon, toasted bread, mushrooms, grated Gruyère cheese...it was insane. I had to rewind that segment five or six times to wrap my head around it. Such a simple, elegant way to create such a glorious dish. It couldn’t be easier to make, either. Hollow out an edible pumpkin, stuff it with delicious stuff, and bake it. Chef Boulud’s version was savory from the mushrooms and cheese. I prefer mine a bit sweeter so I add apple and dried cranberry and use eggnog instead of cream. There’s really no bad answer, though. I’ve made this with chorizo and Manchego cheese and it was great. I’ve used pears instead of apples and mixed in a little maple syrup - also fantastic. Basically, make a stuffing you like and pack your pumpkin. It’s hard to go wrong. Just keep in mind any meats you choose to incorporate need to be cooked before going in the mix. Baking the pumpkin is mostly to cook the flesh of the pumpkin itself. The stuffing mixture will warm up and melt the cheese and warm the cream, but not enough to cook raw meats or sausage. This recipe is substantial enough to serve as a main dish with a salad on the side. Or, you can make it a side dish like I do. No matter how you serve it, this striking and delicious dish is right at home on your holiday table. 2. Cut the top off the pumpkin. Make sure to cut off enough to make it easy to work inside. 3. Remove all the seeds and strings from the interior and cap. Liberally salt and pepper the interior. 4. Combine the bread, sausage, cheese, and cranberries in a bowl. Season with salt and pepper if needed. 5. Pack the pumpkin with the mixture until it is well-filled. 6. Mix together the milk or eggnog and nutmeg. Pour mixture into the stuffed pumpkin. 7. Bake until stuffing is hot and pumpkin flesh is cooked and easily pierced by a knife, between 1 - 2 hours depending on the size of the pumpkin and your oven. 8. Move pumpkin to a serving dish. The outside may be soft and wobbly, so be careful!